Small pairs or low pairs, can be some of the most profitable hands to play in no limit Texas Hold’em if you know how to play them correctly. A small pair is a pocket pair between 22 and 66. (AKA pocket twos, pocket threes, pocket fours, pocket fives, pocket sixes ) Although they seldom win unimproved without making a set on the flop, the real value in a small pair is the implied odds you get when you hit your hand. When you start the hand with a small pair in your hand, you will improve to three of a kind on the flop approximately 1 out of 7.5 times. For example, let say you are playing in a $2/$5 no limit game with a $500 stack. Your opponents also have around $500 in their stacks as well. 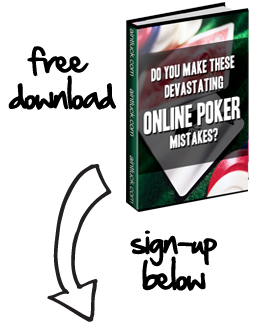 If a player raises to $20 in early position, this is the perfect time to play a small pair profitably. What type of hands do players usually raise with in early position? Early position raisers are supposed to have a strong hand like a big pair or ace-king. This is just the hand you want to be up against with your little pair. If you can flop a set, you have the potential to win a huge pot from a player holding top pair with a big kicker or an over pair to the flop. When you can invest a small amount before the flop with the potential to win a big pot if you hit your set, you have what is called good “implied odds”. A good rule of thumb to follow is that you must be able to win at least 10 times the amount of the initial raise. In the previous example, you had to call a $20 raise so you need to win at least another $200 after the flop to make it worthwhile. Since both you and your opponent have $500 stacks, this shouldn’t be too hard to do. Let assume you have 55 and call the opening $20 raise. The flop is awesome, as it comes 10 5 2 with 3 different suits. You have hit your set! If the raiser has an over pair to the flop like JJ you can possibly get all his chips. You can either raise on the flop to build the pot or slow play your hand and hope your opponent bets again on the turn. Another important tip for playing a small pair out of position is to bet into the preflop raiser when you hit your set. Most players go for a check raise and assume the pre flop raiser will bet the flop. You stand to win a bigger pot by betting into the raiser. Let them raise you on the flop with their over pair. Then you have them committed to the pot when you go all-in. When you check raise on the flop, you give your opponent a chance to get away from their hand cheaply. As you can see, playing small pocket pairs can be some of the most profitable hands in no limit Hold’em. Just remember not to get attached to them if you don’t flop a set. An important rule to live by is “no set no bet”. Only call and see the flop if you can get in cheaply. Make sure that you and the pre-flop raiser have enough chips that you will get paid if you hit your small pair. You want to win at least 10 times as much as you have to invest pre-flop with your small pair. You will flop 3 of a kind with your small pair 1 out of every 7.5 times. Bet into the preflop raiser if you flop a set rather than check raising.